I enjoyed reading Grace Unplugged. So many teens dream of being a famous popstar. Hollywood shows the glamorous side: adoring fans, fame, and fortune. This book helps portray the "not-so-glamorous" side: promiscuity, substance abuse, lies and deceit. Fame and fortune have been the downfall of many a good intention. Grace, the 18 year old in the novel, struggles between her Christian faith and her desire for fame. I feel the author did a great job of making Grace believeable and realistic. Grace's father is a reminder that parents aren't perfect; but they do have their child's best interests at heart. Parents will go to great lengths to protect a child, whether it be to protect the child from the poor decisions of others or the poor decisions of their own making. 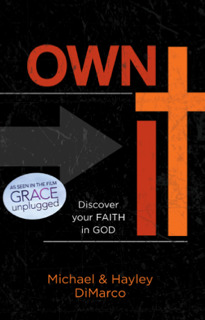 Own It is based on a book mentioned in Grace Unplugged. A friend gives the book to Grace. She reads the book and searches her heart to see if she has truly ever "OWNED" her faith. After being reminded of what it truly means to surrender your whole life to God, Grace has some tough decisions to make. This book made some very good points, some that I had never thought about before. How self-hate is still a form of self-love. And that living in fear or anxiety means that you don't wholly trust God to have it all under control. "If your live isn't changing, then it is possible that God hasn't saved you. " 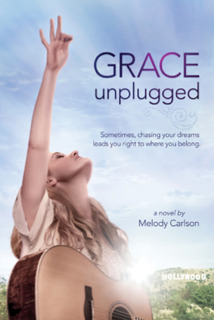 Check out the Grace Unplugged movie trailer. The movie premieres on October 4th. One lucky reader will receive a copy of these books, courtesy of FlyBy Promotions. Just leave a comment on or before October 6, 2013. I will choose one comment at random. I read this book as a read-aloud with my 11 year old daughter. My 4 year old daughter also listened in most of the time. In my opinion, this book is geared more towards boys. 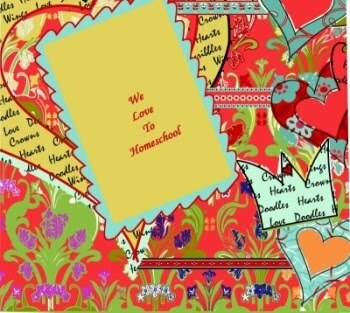 The two main characters are boys and the story is full of their crazy adventures and pranks during a summer on an Ohio farm. While boys may enjoy it more, we still got a kick out of reading it. The antics are humorous and the predicaments the boys find themselves in caused me to laugh out loud more than once. This is a Christian book and it presents the Gospel message beautifully. I enjoyed hearing it explained through the words of a young boy; he explains it simply and clearly. It could be a great way to witness to young children (about ages 8 to 14). Jesus' plan of salvation and the Romans Road are woven into the story nicely. The story does include a great deal of name calling. No curse words, by any means. Just a lot of name calling (like nitwit and numbskull) between the two boys. This didn't bother me, but I know some people might like to know ahead of time, if name calling is something that your child might already struggle with. 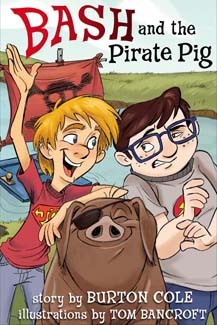 Bash and the Pirate Pig was a fun read-aloud. My daughters and I all enjoyed it. The presentation of the Gospel Message is awesome and I hope that it will be used to reach souls and change lives. One lucky reader will receive a copy of this book, courtesy of FlyBy Promotions. Just leave a comment on or before October 1, 2013. I will choose one comment at random.